Kimi's last day of testing and he is one of the first to be out. Vettel did a lot of laps today, that is really good. Mercedes still appears to be on a another playing field, not surprising. Definitely agree with that. I just hope Ferrari can compete for podium places with Williams and Red Bull. Yes that is the best that we can hope for. I hope we get to see that race simulation today. Thankfully Kimi is getting some early laps in! Tomorrow we will see Barcelona, on saturday we are back at the track. Pictures when we are at home. The internet in the hotel is not so fast. your dear "Greece" is thankful! have a fabulous time girls! such pity i did not manage to join!!!!!!! Weather: Air temperature 10/17°C, track temperature 10/30°C. Sunny. Programme: aerodynamic test, set up and race simulation. 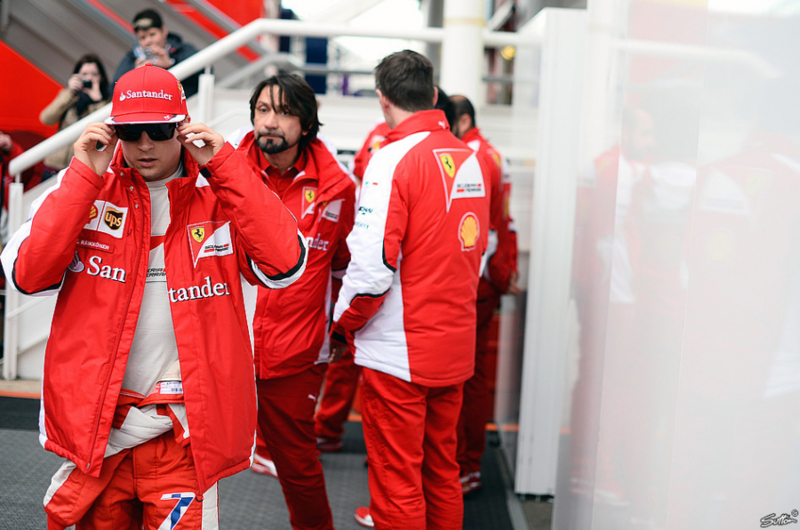 Kimi Raikkonen: “Overall it hasn’t been a bad test since we covered a race distance today. Now we wait to go to Melbourne to see how we stand compared to the others. I wish to thank the Team for the work it has done during the winter”. James Allison: “We’ve got a lot of laps under our belt in this winter testing; but until you actually go out and do the laps for a race, one after the other, and not stopping except to change tyres, you really can’t claim that you’re ready to go to Melbourne and do it for real. So we’re happy to get our first race distance of the winter done, happy to have achieved at the first attempt, and with the reliability that we showed. So I’m pleased with the testing we did over the last two days, which shows clearly that the car works as we expected. Winter testing in Europe always asks slightly different questions from the car than you get when you’re in Bahrain: but it doesn’t turn night into day. Most of what the car really is is revealed here as much as on the other Grand Prix circuits during the year. And I think what we see is a well-mannered car, so we expect these characteristics to be broadly carried over to the other races”. Yesterday the guy we booked the trip was not able to smuggle us in the paddock after the training. Good we had so much time at thursday. We saw Kimi a few times- running to the toilett or to the motorhome. It must have good yesterday, since Kimi did all of that running. (Reuters) - Ferrari boss Maurizio Arrivabene has taken a provocative stance, before the Formula One season has even started, in response to rumours about a clampdown on access passes for teams. Arrivabene, a marketing man who was appointed in November, sat with Ferrari's Mexican reserve driver Esteban Gutierrez and sporting director Massimo Rivola among spectators during testing in Barcelona. "I heard that in Australia there will be more restrictions in terms of passes and I think this is not acceptable," he told reporters on Sunday, the final day of testing before the racing starts in Melbourne on March 15. "So I said to the guys 'OK, if we are going to have a situation where the paddock is going to be empty, it's better if we start training to go to the people and we sit in the grandstands'." "I have to say it was a good experience because the people were very well-educated, we were with our headphones following the test. They were respectful, asking for pictures. It was a good experience and I hope to have others like this." The paddock, where teams have their lavish hospitality units and race engineers pore over data while journalists rub shoulders with mechanics and VIPs, is the sport's closely-guarded inner sanctum. Access to the fenced-off enclosure is by electronic pass, issued by commercial supremo Bernie Ecclestone's Formula One Management. "It was a kind of provocation but I love to do this kind of provocation," said Arrivabene. "I said we need to take Formula One close to the people. We were sitting in the middle of the people. And I don't like to see now and in the future the paddock empty, it's not the right way." Arrivabene, whose team have one of the biggest budgets in the sport, said he had wanted to make a statement. "Nothing is decided yet but we have certain communication that the number of passes is going to be reduced. Normally when you have certain rumours in Formula One, they become reality. So I sit in the stands before it is becoming reality," he declared. "Exclusivity doesn't mean having an empty paddock. This is my clear statement. See how happy Andrea and Verena were on Thursday at the paddock and after all their support to F1, they deserved it. On the basis of 12 days of pre-season testing, it is reigning champions Mercedes who enter the season on a high, having set the quickest times and completed the most laps. But who came closest to matching the Silver Arrows - and who might be struggling in Melbourne?